Whether you’re doing some laid-back snorkeling, riding the wind on a catamaran or even strolling past aquarium tanks, you just might run into some camera-loving denizens of the deep. Who said fish had no personalities? From sharks to sea rays and dolphins, marine life all over the world has been showing off their humorous side in wildly funny photo bombs. Yes, the hilarious phenomenon known as photo bombing has now gone beneath the waves to a world where anything from a toothy shark to a funny-faced ray or a grinning dolphin can pop – or float - unexpectedly into a picture. A fish swimming in front of a diver’s face can give the curious effective of a sort of reverse mermaid, with the head of a fish and the body of a woman, while some of the scarier marine creatures can give the impression that the innocently grinning subject is about to be devoured. Just keep your eye out for wandering undersea creatures that might have a taste for fame; the key is to be quick and grab the priceless shot before they dart away. You can have lots of fun with your camera while enjoying the amazing adventure of Key West snorkeling. If you notice a particularly enormous sea turtle or ray floating behind a friend, ask for a quick smile and take the shot; your friend may be quite surprised, and perhaps a bit scared, to see what was behind him. But there’s no need to worry; snorkeling guides always keep an eye on the water and are familiar with all the local marine life. The whole secret to the outrageous hilarity of animal photo bombs is partly that the human seems to be oblivious to the creature’s presence and partly that, well, it makes you wonder whether perhaps our finned friends really do have a sense of humor. Of course on any Key West snorkeling trip, you can also take plenty of incredible “normal” photos of amazing creatures including brightly striped clownfish, strikingly ugly Goliath groupers, green sea turtles, sharks, sting rays, jelly fish and eels. But for fun factor, the unexpected hilarity of the photo bomb will definitely be the high point of any vacation photo collection, the photo your friends will ask to see again and again. Maybe your animal photo bomb will even become an internet sensation! Parrot fish’s toothy grins can be particularly entertaining. 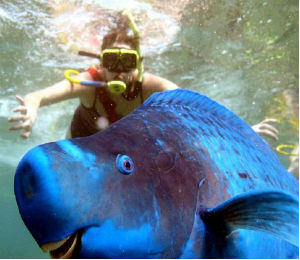 In Australia, tourists love to pose with Gavin, a parrot fish with an unusual love of the camera. A big attraction for divers near Green Island off the Great Barrier Reef, this blue-and-yellow finned cutie loves showing off his pearly whites in hilarious poses with humans. Recently, it looks like a parrotfish in Key West, Florida decided to get a bit of celebrity for himself by hamming it up in front of a local diver. Catching the posing diver totally unaware, this blazing blue cutup popped into the shot taken near Eastern Dry Rocks with a great big grin custom made to go viral on the web. Explore the exciting underwater landscape around Key West and maybe you can find the perfect undersea photo bomb.